"It's a marathon, not a sprint"
In my first job after college, I was an "I-banker" at Deutsche Bank and my first Associate, Campo, used to repeat over and over again the above mantra. I always found it rather ironic, given that my experiences subsequently taught me that banking is a pretty short-sighted profession that prefers to sprint on the backs of its employees. Day after day, week after week, the "fire drills" of the profession burn out most of the employees and the major method of keeping employees is by buying their time at ever-increasing rates. Like few other people that I've met, I think about the long term. I believe that we're constantly building and growing what it means to be "me". Our actions, our words, our choices - they provide us with a body of work that makes up the idea of self. I'd say that from the age of about 5, I understood at a very deep level that what I do today provides the idea of who I am tomorrow - to myself, to my friends, to my parents (the specific story involves Big Wheels, the park and McDonald's..). One of the challenges that comes with this perspective on life is that I'm ALWAYS looking ahead, thinking about what's coming up, where I want to be going and how I should get there. 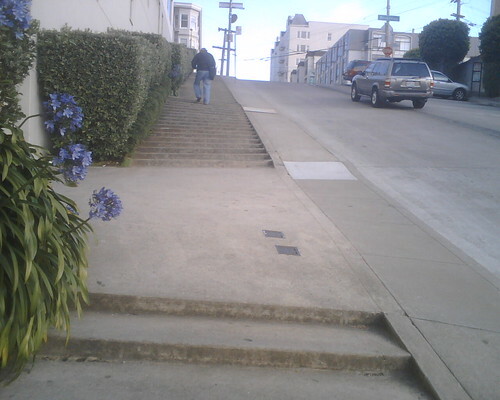 It's similar to what happens as I finish my run by heading up Fillmore St. - I look up to see if there are obstacles/people that I'm going to have to adjust for and I make sure to adjust so that I don't have to suddenly change my pace or gait. However, if all that I'm focused on is UP the hill, I forget that there are things at my feet, these steps, that I have to negotiate on my way up the hill. If I forget to watch what's directly in front of me enough, I'll NEVER make it up the hill to the obstacles in the distance. This is a tradeoff that all of us are faced with in our lives. The question is an everpresent undercurrent every single time we make a choice: "Will you think about just right now or are you thinking about tomorrow, the next day and 5 years from now?". We answer it with our actions, our words, our perspectives, our self-measurements.. our lives. Some of us ONLY live in the moment. Others among us only live in the IMAGINED possibilities. Over the past several years this question has consumed me. Again and again, I've looked at this question, turned it over in my head and wondered to myself, "How I can know if I should be thinking about the long term or the short term right now?" It was only this past year that I successfully addressed it. The problems of perception are myriad, but one of the hardest is accepting the fact that your view of the world disallows you from seeing ALL possible angles. I've come to accept that no matter what, I always see the sprint through a marathoner's eyes. I always view the short term choices through the prism of my long term goals. I'm never going to see the world as others who think only about the short term think. 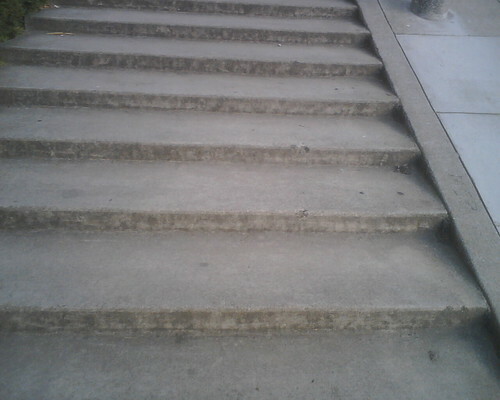 I can only hope to know enough about the steps in front of me that I successfully navigate them and save myself from falling on my face. I'll leave the bulk of the responsibilities to those who think about the short term. My talents lie in the long term and it is there where I'll do my best work. I feel like I'm finally ready for this marathon. See you at the finish line. let me know where you want me to be and i'll hand you a cup of water as you cruise by.